The 'I Wanna Be Adored' hitmakers will play Belfast's SSE Arena on June 13, London's iconic Wembley Stadium on June 17, and Glasgow's Hampden Park on June 24. 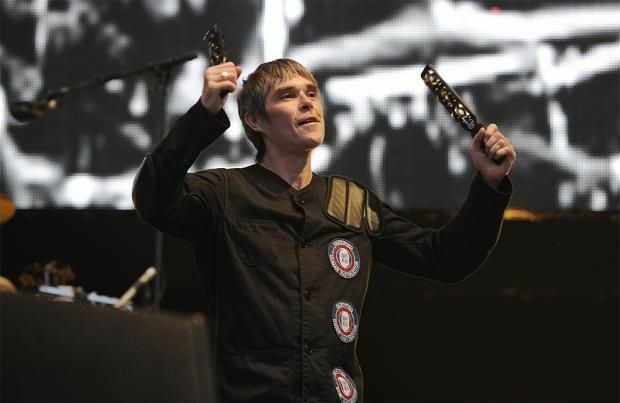 The shows mark the first the 'Waterfall' musicians - comprised of Ian Brown, John Squire, Mani, and Reni - will have played since June this year when they took over Manchester City's Etihad Stadium for four nights, aside from their headline slot at Scottish festival T in the Park in July. The news was revealed after images of lemons - which are synonymous with the band after having featured on a number of posters and album artwork in the past - were plastered around Wembley on Monday (26.09.16). The same images were seen around record shops in Manchester shortly before the shows at the Etihad Stadium were announced. Rumours have been circulating about a full UK tour, as well as a headline slot at 2017's Glastonbury festival, but nothing else has been confirmed yet. The news of new UK dates comes after the 'Fool's Gold' singers recently confirmed they would be heading out to Australia to perform three dates at the Sydney Opera House. The shows will be the band's first performance in Australia since they made a surprise appearance at Future Music Festival in 2013. It is also as yet unknown if the band will release any new material alongside the UK shows. Ahead of their shows in Manchester this year, they released 'All For One' and 'Beautiful Thing', which marked their first releases in more than 20 years. At the time, it was rumoured that a full album was on the way, however there has been no more news on that since the release of the two singles. Tickets for all three UK shows go on sale at 9am on Friday, September 30.